Contribution to the new Biodiversity Law (DLR 15/2012/A) in the Autonomous Region of Azores. Establishment of the Site of Communitary Interest Serra da Tronqueira / Planalto dos Graminhais (PTMIG0024) as part of the NATURA 2000 network. Approval of the Management Plan of São Miguel Island Natural Park for the areas included in this project. Elaboration of a Vegetation Map for the SPA Pico da Vara/ Ribeira do Guilherme. Assessment of the methodologies for the control of new invasive alien species (IAS), such as the Australian Cheesewood and the Chilean Rhubarb and the production of a manual of IAS control available for everyone. Hosted a Workshop about business opportunities in protected areas in the village of Povoação, as well as several other lectures on the theme. Involvement of many entities related to tourism and environmental conservation in the Technical team for the implementation of the European Charter of Sustainable Tourism (ECST) (the Regional Directorate of Environment, Regional Directorate of Forestry Resources, Regional Directorate of Tourism, Municipality of Nordeste, the Association for Rural Promotion and Development and AZORINA - Sociedade Gestão Ambiental e Conservação Natureza S.A). Meetings in all parishes of the region and hosting three Forums for the ECST in ‘the Lands of Priolo’ with more than 100 participants. Preparation of a diagnosis, strategy and action plan for the development of sustainable tourism in ‘the Lands of Priolo’ (municipalities of Nordeste and Povoação). Awarded the European Charter of Sustainable Tourism certification to ‘the Lands of Priolo’. Started implementation of the action plan and held the first Annual Forum after the approval of the certification scheme of the ECST. Registering and disclosing the manual of Priolo Brand among interested entities. First application phase of Priolo Brand with 19 companies associated to it. The European Charter for Sustainable Tourism (ECST) and its association to local companies through the Priolo Brand will contribute to the development of the Lands of Priolo and at the same time will allow the long-term conservation of its natural values. All involved stakeholders are committed in tourism planning and environmental protection as well as contributing to the accomplishment of the action plan. Active nursery with a total production of nearly 120,000 plants, over the 2009-2013 period. Annual production of approximately 30,000 plants after the 2nd year of the project. • Development of protocols for the production of the main natural forest species of the Azores. Gathering of seeds of several native plant species for nursery production and direct seeding in the intervention areas. 21 different native species were produced and planted, among trees, bushes, and herbs. Among them were 5,000 Dandelions, 500 Buckthorns, 6,000 Faya trees, 1,500 Azores Cherries, 4,500 Azorean Blueberries, 65,000 Azorean Heathers, 500 Laurestines, 200 Azorean Cedars, 3,000 Picconia sp., 1,000 Cape Myrtle, 1,000 Azorean Bellflowers, 1,000 Azorean Hollies, 1,000 Hypericum foliosum, 13,000 Azorean Laurels, 5,000 Common Heathers and 500 Luzula purpureosplendens. 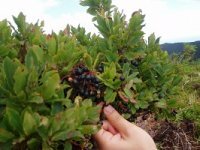 Creating an orchard in the Furnas Lake water basin with 726 selected plants of Azores blueberry and supporting the creation of another two orchards within the recovery of Furnas Basin project (Azorina/PNISM). Sustainability plan for the plant nursery. Raising awareness actions and support to the Pedagogic Centre of the Povoação Secondary School. These nurseries allowed us to produce a wide variety of plants, from trees to bushes and herbs, both for the intervention areas of the project and as a contribution to other projects, e.g. the restoration project of the Islet of Vila Franca do Campo and several education and raising awareness actions. Control of Cletra and Yellow Ginger-Lilly in 14.5 hectares of high altitude natural vegetation around Pico Bartolomeu. Control of Australian Cheesewood, Cletra and Yellow Ginger-Lilly in 5.9 hectares of low altitude natural forest in Labaçal/Pico da Vereda. Control of Cletra and Yellow Ginger-Lilly 20.9 hectares of high altitude natural forest around Malhada. Control of Australian Cheesewood, Thorn Tree, Cletra and Yellow Ginger-Lilly in 11.2 hectares of low altitude natural forest in Mata dos Bispos. Planting of around 35,000 native plants produced by the project and more than 2,000 produced by the Nordeste Forestry Services. These actions favoured the restoration of at least 50 hectares of Laurel Forest area. Mapping of Chilean Rhubarb, Cletra and Tree ferns. Fence built to prevent cattle entering into the intervention area. Manual removal of more than 18 tons of Chilean Rhubarb in the intervention area. Cutting of 1.5 hectares of Red Japanese Cedar edges. Mechanical blocking of abandoned accesses and drainages by building 127 ditches of soil and manual construction of 41 ditches. Requalification of the pedestrian trail Povoação/Pico da Vara. Inoculation of Sphagnum spp. mossses in key areas. Planting of 26,000 native plants. 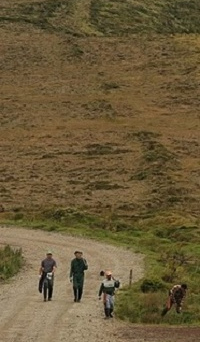 Creation of cattle-free areas in the peatbogs areas. Removal of Chilean Rhubarb’s frutification. Manual removal of Chilean Rhubarb in the targeted area and along 10 km of access roads and trails. These actions will favour the mid/long -term recovery of an important area of peatland with very positive effects in water retention and control of hydrological cycles in the region. More than 93 raising awareness actions for the general public (820 participants). 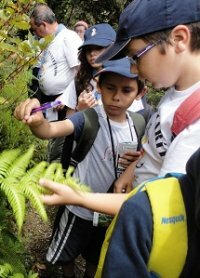 Participation with the ‘Biology in Summer’ national Programme from 2009 to 2012, with 43 activities (303 participants). Hosting 10 events in 5 municipalities of the island of São Miguel. 10 exhibitions about the Laurel forest in 6 different locations of São Miguel since the beginning of the project. Creation of the exhibition ‘De Ossos nas Mãos’, which was exhibited two times in ‘the Lands of Priolo’. Collaboration with two other exhibitions, one about peat bogs and another about recovery of Atlantic habitats, all of them for the general public. Participation in 12 fairs and events for disclosing, 4 of which were international, and in 7 congresses. As a result of these actions an increased on knowledge and awareness about native species and the alien species threat was observed in the population of the island of São Miguel. 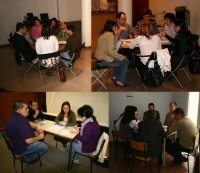 Our communication strategy and all the above mentioned activities have resulted in a quantifiable increase in the knowledge about the project and native habitats of the Azores at a regional, national and international level, raising public awareness about their existence and the importance of their conservation. As a result of this and previous projects covering more than 10 years, we have been able to monitor the evolution of the laurel forest in the targeted areas. We monitored peat bogs’ water levels along the year to better understand the hydrological cycle. We followed the germination and growth of the plants produced in the nursery. We monitored the plant’s survival rate used in the restoration actions in the forest. We supported the annual monitoring of the population of the Azores Bullfinch, an endemic bird found only in this area and a good indicator of conservation status of the Laurel forest. Monitoring has proved essential to understand how our actions are effectively controlling the threats and also recovering the priority habitats and their ability to provide services to the Human communities. This also allowed to retrieve important knowledge for future actions and projects. A total of 12,000 native species were planted in the islet of Vila Franca do Campo, after being propagated in the nurseries of the project in partnership with LIFE+ Safe Islands for Seabirds (LIFE 07 NAT/P/000649). Supporting the sustainable tourism seminar in Corvo island. Disclosure of the protected area and the Lands of Priolo in the British Birdwatching Fair (United Kingdom). Collaboration in the recovery work developed in the Furnas Lake Basin by Azorina. Exchange of expertise and cooperation with other LIFE projects: LIFE Buçaco, LIFE Higro. 2 trainees and 6 volunteers/international trainees, on average, included in the project annually. Support to the production of scientific projects such as MSc and BSc thesis. Mapping of the Azores Cedar in the SPA Pico da Vara/Ribeira do Guilherme. Second Atlas of Priolo in 2012.
Review of the Action Plan for the Azores Bullfinch and production of a new Action Plan for 2010-2019. Survey of Snipes in Planalto dos Graminhais. During this project, the Interpretation Centre of Priolo received more than 10,000 national and international tourists.